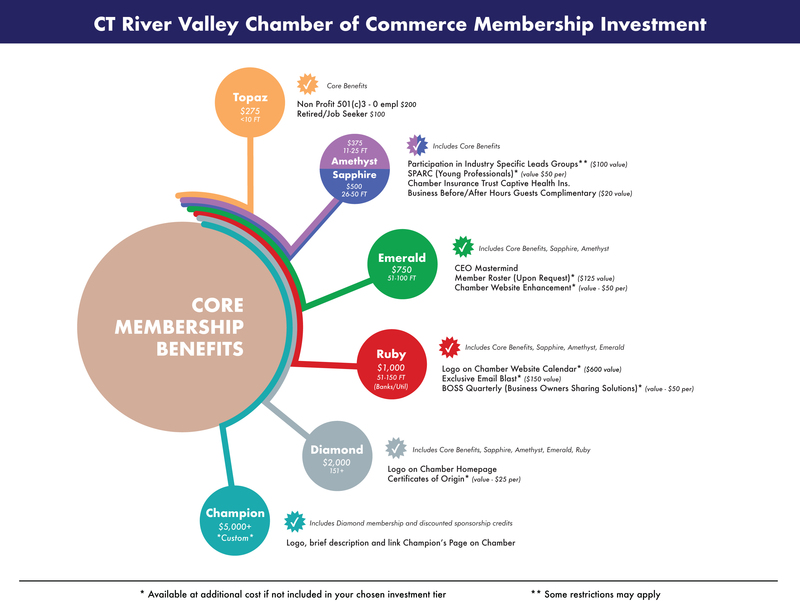 Thank you for belonging to the CT River Valley Chamber of Commerce (formerly the Glastonbury & East Hartford Chambers). In these trying economic times, a Chamber membership is more valuable than ever before. The CRV Chamber works hard to provide the best service possible to our members. Through programs and committees, networking events, advocacy work and much more, the CRV Chamber provides opportunity for all members to better their businesses and become involved in the local community. Here’s a quick summary of our key programs and events. Keep in mind, we'll be rolling out new a new due's level structure, effective July 1, 2019. Annual Meeting & Dinner: This flagship networking event draws over 200 prominent business professionals along with our Board of Directors, Board of Trustees, Ambassadors, Team Leaders and award recipients for our most prestigious event of the year. CT River Valley Classic Golf Tournament: Every spring 140+ golfers enjoy a shotgun tournament including a lunch and dinner banquet, for networking on the field. Glastonbury Riverfront Music Series: These free concerts are held at the Welles Street Riverfront Park over four Wednesday evenings, every July. Join us for great music in the summer air. Feel free to bring picnic supplies and nab a spot near the front! This event is BYOB and family (& pet) friendly. Rest assured, there will be food trucks on deck to provide dinner. The Apple Harvest Festival: It wouldn't be Fall in Connecticut without Glastonbury's Apple Fest, attracting 23,000+ attendees every October for live music, food and all things New England. Located at a bend of the Connecticut River, the Apple Harvest Festival in Glastonbury has continually been ranked as one of the state's most popular events. You'll enjoy three days of live music, vendor booths, food trucks, amusement rides, the Angry Orchard 5K, a Harvest Pub and more. Angry Orchard 5K: Sunday morning at the Apple Harvest Festival. Over 1,000 runners and a Kids’ Fun Run! Breakfast Speaker Series: Panel discussions on pertinent topics ranging from legislative budgets to sustainability in modern business. Bids, Bites & Beer Fundraising Auction: This is a new Chamber event, taking place on National Beer Day that features both a live and silent auction, locally sourced food pairings and craft beer/wine tastings. Leadercast LIVE: The world's largest one-day leadership event, with more than 100,000 attendees participating at 700-plus locations in 20 countries around the globe. The BIG Run: The BIG Run is an internationally celebrated event, taking place on Global Running Day. This 5K run traverses the East Hartford Riverfront, in full view of the Hartford skyline. You'll be racing and timed against runners all over the country, with national leader board rankings at the finish line. The BIG Run is open to runners of all abilities! Young Professionals Group | SPARC: We are developing a facet of the Chamber dedicated to furthering the interests of young professionals in the Greater Hartford area. This group is founded on the pillars of altruism, social engagement and education. Learn more about SPARC. Special Interest Groups: Health & Wellness Council, Women of the Workforce (WOW), Advanced Creativity in Marketing & More! Leads Exchange Groups: The Chamber's Leads Exchange Groups are open to Chamber members and those interested in joining the Chamber. All attendees have an opportunity to introduce themselves, explain what their business has to offer and what lead they are looking for, in a 30-second commercial. Feel free to bring business cards and marketing materials. We offer both morning and afternoon options. Industry Specific Leads Group: This is an amendment to our highly popular monthly Lead Exchanges. It is a closed group, which you must register for. Note: One individual per profession may be admitted. Business After Hours: Monthly casual networking event hosted by a Member to showcase their business, and network with area professionals in a 'happy-hour-like' atmosphere. See this year's lineup. New Residents Program: For a nominal fee per resident, Chamber members may promote their business to our newcomers in a packet mailed to their home. Interactive member database: Can’t leave the office to engage? Our Members Only Section can be accessed with credentials provided to each member. It allows you to enhance your profile, add social media links, employee changes, businesses description, post job openings and discounts for the community to see. It's a great and easy way to boost your company's SEO. Staying Connected: We bring the latest headlines, upcoming events and programs for the week directly to your inbox every Thursday morning. Every other Monday we send out a Member Newsletter, highlighting what's new with our Members. All press releases may be sent to travis@crvchamber.org. We are also active on Facebook, Twitter, Instagram, YouTube, LinkedIn and our local newspapers. Sign up for our E-Newsletter. Workforce Partnership: The CT River Valley Chamber is pleased to be joining with Goodwin College's Workforce Partnership Program. Chamber members are eligible for the partnership tuition discount of 25% discount, provided they are current members in good standing. Hartford SCORE: Make an appointment to receive one-on-one, expert advice from retired business executives. Download the application form here, or contact the Chamber to schedule your appointment. We understand your time is valuable, and, even if you are unable to attend Chamber events, please know your membership investment is working full-time on your behalf to advocate for pro-business policies and bolster our local economy. We value your comments and observations, so contact us at any time with your inquiries. Please note, with the new Chamber, we have new Tiered Dues which afford you the option to invest based upon your level of participation. Contact us for more information.